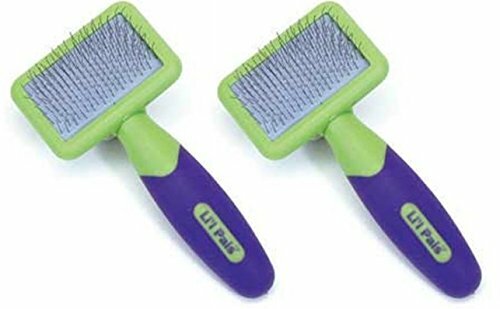 Our Li'l Pals Dog Slicker brush with Coated Tips is designed to remove mats, tangles and loose hair from your puppy or toy breed. Featuring flexible pins with plastic tips, this tool contours to the dog's body for efficient grooming. Featuring soft wire bristles to lift loose hair, mat and tangles. These dog slickers also distribute natural oils for a soft, shiny coat while gently removing dead hair. The Li'l Pals grooming line encourages a stronger bond between the owner and pet. If you have any questions about this product by LilPals, contact us by completing and submitting the form below. If you are looking for a specif part number, please include it with your message.